The Falun Dafa Association of New South Wales is a voluntary group which represents practitioners of Falun Gong in Australia’s most populous state. Falun Gong is a traditional Chinese spiritual practice that has been persecuted in its homeland since 1999, after gaining rapid popularity. President of the Falun Dafa Association Dr Lucy Zhao says the Chinese authorities often go to great lengths to attack the practice, and attempt to prevent information about its persecution in China from finding a wide audience. “This latest defamatory and highly abusive correspondence by the Consulate once again highlights the Chinese Regime’s total disrespect for the fundamental freedoms we hold dear in a free country like Australia,” she said. China’s consul general told parliamentarians that their participation in the briefing could “jeopardise the NSW-China cooperation,” according to a quote from the letter which appeared in the Sydney Morning Herald. Despite the veiled Consulate threat, Mr Shoebridge emphasised the importance of parliamentary discussion on unethical organ trade. “The unethical international trade in human organs goes well beyond China and deserves an informed and open debate, not this heavy handed politicking,” said Shoebridge. But while half a dozen members of parliament attended the briefing, others changed their mind at the last minute. 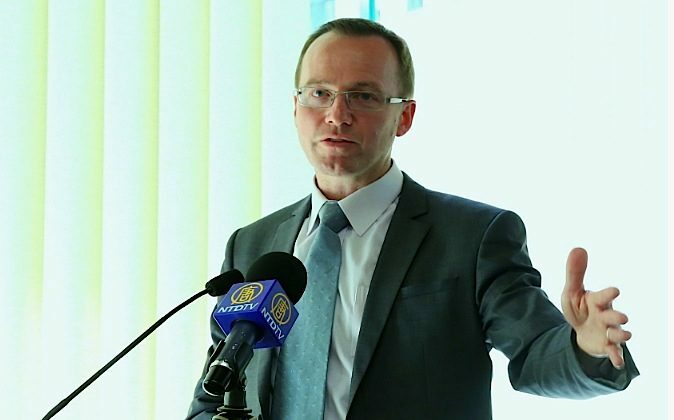 Nine government, opposition and conservative members of parliament, who had previously confirmed their attendance, failed to turn up according to a press release published on David Shoebridge’s website. Five Greens MP’s and the single Animal Justice Party MP attended the forum. “It is truly disappointing that they felt that they could not stand up to these inappropriate bullying tactics employed by the Chinese Consulate,” said Shoebridge. It remains unclear if the decision to not attend the forum were personal decisions or as a result of general directives from the Liberal and Labour parties. At the briefing, Shoebridge explained to members his proposed legislative amendment – Human Tissue Amendment Bill, which aims to bring harsher punishment to transplant tourism. Dozens of patients are believed to travel overseas from NSW to seek quick transplants in areas where organs are readily available due to unregulated organ donation systems or unethical practices. According to the Australian and New Zealand Organ Donor Registry (ANZOD), the NSW rate of organ donation is the lowest in the country, at 12.6 per million people. While waiting times for an organ are up to two years in Australia, in China operations can be scheduled in advance some 2-3 weeks from the time of request. Such short waiting times and availability of organs is attributed to a vast “live organ bank” in the form of prisoners of conscience and death row inmates. “While China has been promising to phase out its prisoner organ use, there have been little evidence to suggest that this has actually happened,” says Dr. Noto from DAFOH. “Because we have the lowest donation rate [in Australia], more people are potentially likely to go overseas to seek a quick transplant in places like China,” said Dr Bryskine. Such individuals would run a risk of receiving an organ forcibly taken from an unwilling donor. While there is no official register of organ recipients returning from overseas, a journal article published in the Medical Journal of Australia in 2005 titled “Outcome of overseas commercial kidney transplantation: an Australian perspective” observed that overseas organ transplants carry significant risk of infections such as HIV, hepatitis B, graft rejections, and death. “Those who do go overseas would then fall back on our healthcare system, costing money for the health system of NSW to care for them,” Dr Bryskine added. Following the briefing, over 71,000 signatures were tabled in the Legislative Council by Shoebridge, in support of his proposed Bill. The total count of the petition, which has been ongoing since 2013, now stands at over 240,000, making it the largest petition in the history of the NSW Parliament. Despite the Communist regime's information blockade, a mainland Chinese petition condemning organ harvesting has gathered over 50,000 signatures. As Chinese medical officials tell citizens to forget about the past, Congress calls for an investigation into China’s organ transplant abuses.